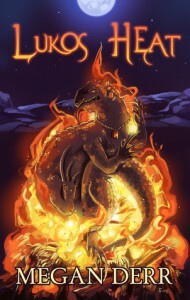 Lukos Heat was previously published in the Anthology Dracones. Now, I didn't know whether the story had been revised or expanded, and I didn't read the anthology so this opinion is based on this edition only. I would say this again, and again, and again, I ♥♥♥ Megan Derr's grumpy characters. I don't know how she does it but she always makes her grumpy characters so frickin' endearing. That was what I felt for Najlah, the hornless dragon in this story. He was so adorable. The way that he thought of the other species to be "below" him, the way he thoughts fire (and heat) as the best. He was so grumpy I just wanted to snuggle him. As usual with Megan Derr's shorter story (or novella length) I felt that the background wasn't explored fully. I should get used to it by now but I still wished that it wasn't so. There were more to these lives of the dragons, and the wolf, and the animosity between the kingdoms that I felt was kept solely in the mind of the author and hadn't fully presented to readers. Which made it slightly less satisfying. But I did love Najlah and his relationship with Barkus was interesting -- especially since Najlah couldn't exactly speak human (even when he was in his human form). So the whole 'bonding' with the pack was cute. I won't mind revisiting these characters.